We present our Top Ten Business Success PowerPoint Templates PPT Backgrounds for Slides 1112.Use our Competition PowerPoint Templates because; inform them of the various means they have to achieve them. Use our Winners podium PowerPoint Templates because, Timelines Display: - You have developed a vision of where you want to be a few years from now. Use our Business PowerPoint Templates because, you have the process in your head, our template design showing will illuminate your thoughts. Use our Success PowerPoint Templates because, to take your team soaring to the pinnacle they crave. Use our Signs PowerPoint Templates because, Timelines Template: - Getting it done may not be enough. 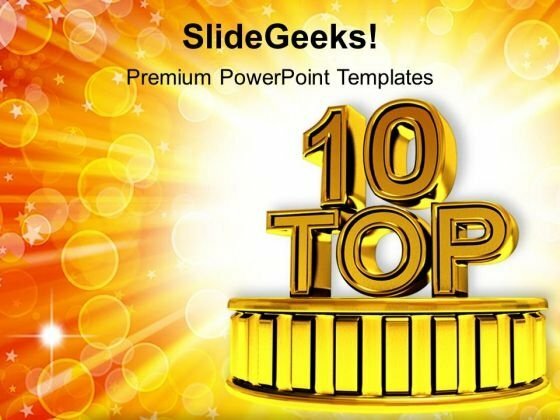 Use these PowerPoint slides for presentations relating to "Top 10 on a podium, competition, success, business, signs, and winner Excel at the dais with our Top Ten Business Success PowerPoint Templates Ppt Backgrounds For Slides 1112. Better the best with your ideas. Our Top Ten Business Success PowerPoint Templates Ppt Backgrounds For Slides 1112 are the result of extensive brainstorming. A lot of debate goes into each one.